No one could guess how that one email would turn our week upside down! When we wrote back asking what type of “pet” the writer was referring to, the answer surprised us – it was a caracal. Caracals are pretty rare in the private sector. Rescuing and losing Ivan and Nigel not so long ago, it was out of the ordinary for us to get another call on a caracal in need of a home. Just a year and a half old, Aurora had always lived indoors. Now, her owner was taking advantage of an opportunity overseas and she’d need a new home very quickly. Thanks to our supporters, we know that when a cat’s in need, we step up to do all we can for them. She had to know she would be safe before the only person she knew in the world moved out of the country and left her behind. We packed a bag and quickly made arrangements to travel over 1100 miles one way to pick her up. We never know what we’re going to find when we arrive, but this one really surprised us. It wasn’t like most surrenders. Aurora was living in a luxurious home, with the finest of everything. And yet, the juxtaposition of seeing this African cat looking longingly through a glass door at the birds in the surrounding woods, making those caracal calls we know so well, contrasted so much with being inside four walls. When asked why he had purchased her in the first place, he said he’d always been fascinated by exotic things. He paid $7500 for her and was on a breeder’s waiting list for over two years. Even after all of that, only a year and a half later, it was time for her to move on – as he was. It’s heartbreaking to see these innocent animals who, through no fault of their own, have to have their world turned upside down. And you can’t explain why it’s happening to them. As he showed us around the house, we could see all the classic signs of what we’ve seen so many times before. As the cat matures, the wild cat traits begin to emerge. A kiddy pool being used as a litter box to try to encourage her to use it. “Her” bedroom with a sheet of linoleum laid over the carpeting. A shredded futon. Her needs to stretch her wild side were becoming evident. Having been front-paw declawed and spayed, she’d also recently been through bowel obstruction surgery after ingesting a toy. He loaded her into her crate, carried it to our vehicle. We certainly couldn’t help but choke back our own tears. She didn’t know why she was leaving the only person she’d ever bonded with. And she certainly didn’t know what would lie ahead for her. For almost 18 hours, through eight states, she traveled so well. She watched hundreds of trucks whiz by, never getting used to that sound, though. We spent the time wondering how best to make this a smooth transition for her. It’s always hard, in the beginning, as we’ve seen so many times before. We pulled into the sanctuary with her in the wee hours, just before dawn. We couldn’t help but think how apropos since Aurora was named after the Roman goddess of dawn. Now, her life would be changing forever. In time, we hope that once she hears the chirps and calls of the servals and caracals at the Sanctuary, once she gets to experience the outdoors she longed for, she’ll understand that this truly is the beginning of the rest of her life with many who will love her dearly at her forever home. And we hope her story serves as another example of why exotic animals should not be considered pets – no matter the best intentions or the means to buy them. As with Aurora, there just aren’t that many options when life circumstances change. We know our caretakers and supporters will do everything possible to help Aurora transition to her new life and we’ll keep you updated in the weeks ahead. 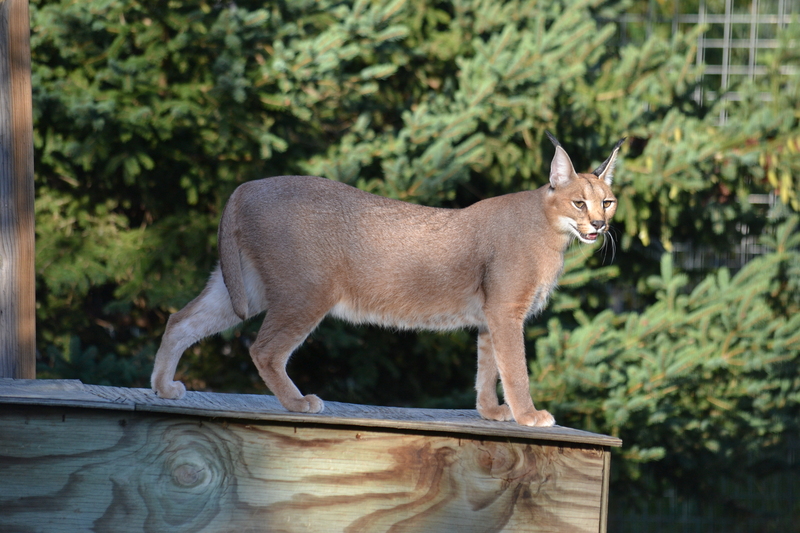 After her intake exam results came in, Aurora was released into a large habitat with servals Cleo, Mufasa, and Morocco, as well as Sampson, the caracal. She came into her own right away, confidently exploring the perches, platforms, dens, trees, and tall shady grass. It’s as if she let out a huge sigh of relief that this is the life she’d been longing for. Finally, it’s hers to enjoy. We’re thrilled to see how quickly she’s living wild at heart, as she was meant to be.